Over 12 years we have converted this small and beautiful farm on the edge of the Cotswolds into a thriving organic farm. We now produce Beef, Lamb, and Firewood and have an acre of market garden. Stroud Slad Farm is a mixed organic grassland and woodland farm of 120 acres. The farm is situated on the Cotswold Escarpment and has distinct soil profiles ranging from pure clay in the fields next to the Slad brook to thin Cotswold brash on the upper fields and woodland � where there are also pockets of clay. 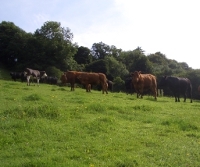 Our single suckle beef herd of 17 cows (mixed Sussex/Aberdeen Angus cross) produce 17 steers and heifers annually for beef. 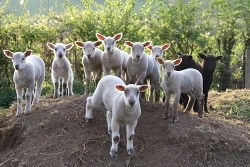 In addition our sheep flock of 35 ewes produces about 65 lambs each year. 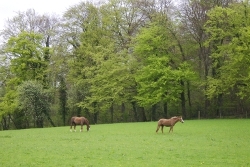 The grassland is used in rotation to provide summer grazing and hay or silage crops for winter feed. Straw for bedding is bought in from a local farm. In addition the farm supports a small community enterprise with 15 families growing vegetables for their own consumption. Just to the South West of the farm buildings is an apple orchard. This was planted six years ago with traditional juicing varieties. The orchard is sited in the same field as an orchard last shown on the farm map in 1873. Evidence of the original cider trees are still in some of the hedgerows of the farm. The orchard produces about 400 bottles of Apple Juice each year. The South East side of the farm is 43 acres of woodland classified as Ancient Woodland and is managed for its bio-diversity and a sustainable level of timber production. 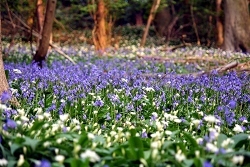 The farm has for the last 15 years been registered and inspected each year by the Soil Association as an organic farm.